Established in the year 1996, we “R. 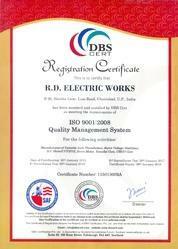 D. Electric Works”, an ISO 9001:2008 Certified Company are a well-established organization engaged in manufacturing and supplying a comprehensive assortment of Power Control Equipment. This range includes Variac Transformer, Stabilizer Products and Constant Voltage Transformer. The equipment provided by us are acknowledged among our clients for their features like easy to fit, application specific design, sturdy construction, impeccable finish, ruggedness and excellent quality. These offered products are designed by making use of the best quality basic material and top notch technology in adherence with industry quality standards under the supervision of our dexterous professionals. Apart from this, these equipment are provided in various designs, sizes and patterns in order to meet the variegated demands of our esteemed customers. Being a quality centric organization, our quality controller rigorously examines these products on a set of parameters to assure their faultiness. Supported with a state of art infrastructure, we are the renowned manufacturer and supplier of the excellent quality range of power control equipment. We have separated our infrastructure facility into various sub-units like manufacturing unit, quality testing unit, warehousing & packaging unit, research and development unit. In addition to this, our infrastructure facility is installed with modern machines, equipment and technologies, which make us efficient to manufacture high quality products within the limited time frame. In order to meet the enormous demands of our valuable clients, we are engaged in providing our customers a wide range of products. Owing to our customer centric approach, ethical business policies and quality testing strategy have formed a huge client base spread all across the country. 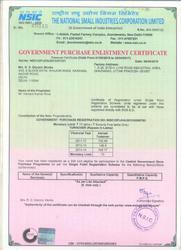 Our business process is led under the capable guidance of "Mr. Hemant Rout". His half a decade of year’s industry experience and dedicated support provided by professional teams allow us to successfully meet varied demands of the customers. He is believes in offering a qualitative product array to our valuable patrons. He also provides superior facilities to company employees for keeping them dedicated toward prior work. Manufacturing and Trading of Power Control Equipment. To provide complete satisfaction to the clients at every cost by rendering quality solutions to them at a very brisk pace. With a team of dedicated professionals, we have been working hard to fulfill every need of the clients within their budget. R.D. ELECTRIC WORKS has developed a contemporary infrastructure support. This helps us to carry out our business operations in a systematic & precise manner. Our manufacturing unit is equipped with all the latest and advanced machines to produce innovative and quality products. We regularly adopt modern manufacturing techniques to ensure that we continuously upgrade our systems and capabilities to deliver world class products and services. Since our incorporation, providing supreme quality products has been a sole concern of us. The products offered by us are developed in line with the set international quality standard and guidelines. Additionally, our offered product array has gained wide appreciation in the industry for their sturdy construction and longer service life. To assure flawlessness of these equipment, quality experts strictly test them against various parameters. Our company is assisted by an experienced and talented team of professionals, which enables to offer a quality range of power control equipment. They have excellent technical knowledge in their respective field. This helps us to provide customization option and develop the array as per the various specifications given by our customers. They remain abreast with the modern technological advancements in the market. 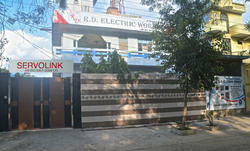 We are well known for high quality range of power control equipment. So as to provide the high grade quality products, we are indulged in testing these it on pre-defined parameters. Besides this, our ethical business practices make us an eminent choice among our clients.